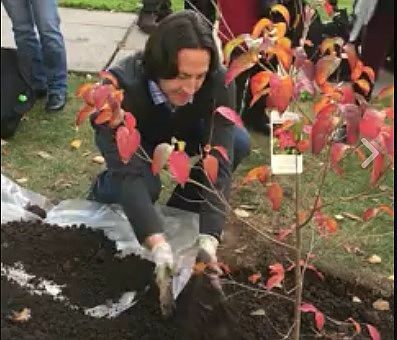 Share the post "Thomas Molnar Plants Rutgers Scarlet Fire Dogwood Tree in Honor of Rutgers University 250th Anniversary"
Associate professor Thomas Molnar planting the Scarlet Fire dogwood. Thomas Molnar, School of Environmental & Biological Sciences associate professor in the Department of Plant Biology and Pathology, worked for 10 years on breeding the Scarlet Fire dogwood that the university planted in front of Old Queens in New Brunswick in honor of #Rutgers250. Molnar’s efforts continued the 4o years of dogwood breeding by renowned plant breeder and Professor Emeritus Elwin Orton.